Fender Paramount PM1 Limited Edition An expansion of the Paramount Series acoustic guitars, the PM-1 Limited Adirondack Dreadnought, Rosewood combines upgraded features and refined style to create a responsive and inspiring instrument. Carefully crafted for superior tone, high performance and refined visual appeal, this premium instrument will satisfy serious players searching for their next guitar. The solid AA Adirondack Spruce top is extremely lively, with an extended frequency range and enhanced dynamic response that responds to every nuance of your playing, no matter how hard or fast you strum or pick. The scalloped X-braces are also crafted from Adirondack Spruce and carefully placed for detailed note definition, working in harmony with the top for the perfect amount of strength and ringing sustain. The rich, all-solid Indian Rosewood back and sides work with the AA Adirondack Spruce top for well-balanced, highly articulate and responsive tone. A Fishman- and Fender-designed PM preamp is specifically voiced for the dreadnought shape, instantly responding to playing dynamics while bringing out the guitar's most subtle tonal nuances. Complete with tuner, tone (bass and treble), phase and master volume controls, this collaboration in preamp design faithfully reproduces the guitar's voice when amplified. The fast-playing "C"-shaped mahogany neck and ebony fingerboard are carefully crafted to accommodate any playing style while offering comfortable performance anywhere on the neck. The durable bone nut and bridge pins create balanced tone while increasing the guitar's tuning stability by allowing the strings to glide slightly while bending, instead of binding at the nut. Inspired by Fender's '60s acoustic instrument designs and early 20th-century motifs, while maintaining their footing in modern design, this guitar was made for the spotlight. The thin lacquer finish allows the body to resonate freely, making the instrument breathe with lively tone. Thinner body binding along with new inlays add a refined touch to the appointments, evoking a retro vibe. 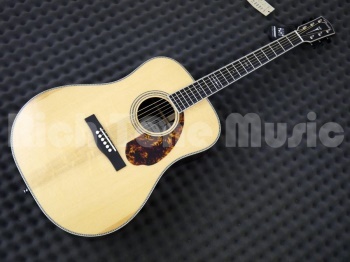 Includes deluxe hardshell case and humidifier.